Today has left me feeling confused, excited and sad all at once. I had one of my more memorable days down on one of the auld haunts. 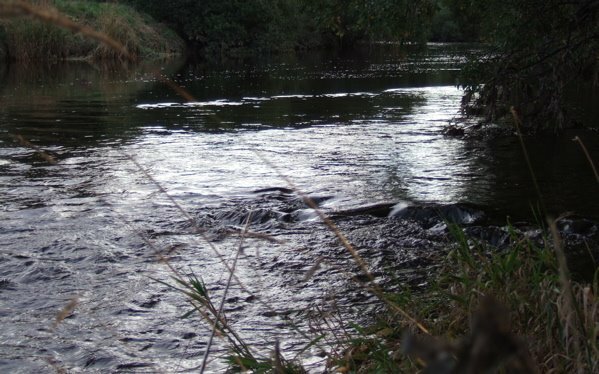 To understand where I’m coming from, it helps to understand a little about what this bit of river is like. The word dour was invented specifically for it. I’ve made one or two posts about it previously, after catching begger all. This is quite normal. However, as is so often the case, the dourest places can hold the biggest trout. The water was beautiful today, perhaps the nicest colour and height I’ve seen it this season. 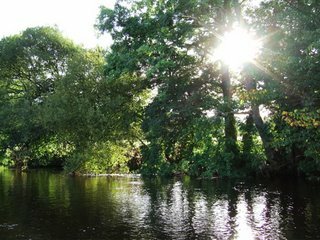 When the sun shines right the whole river bed lights up and the water glows a light whisky yellow. I remember the first time I fished this river, after only having fished on the Kelvin in Glasgow. 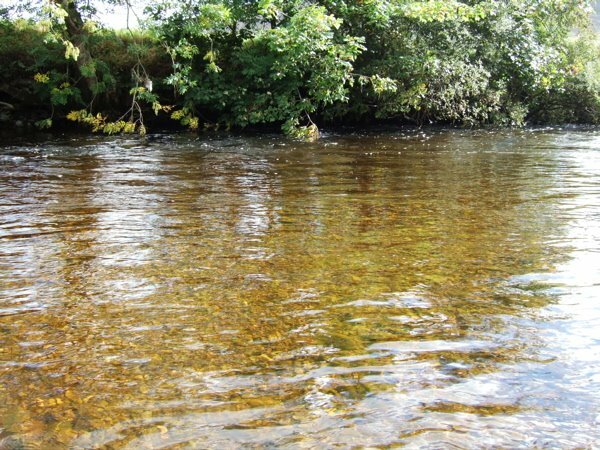 I hadn’t imagined rivers were this clear anywhere in Scotland. The more I fish this bit of water the more I’m mystified. 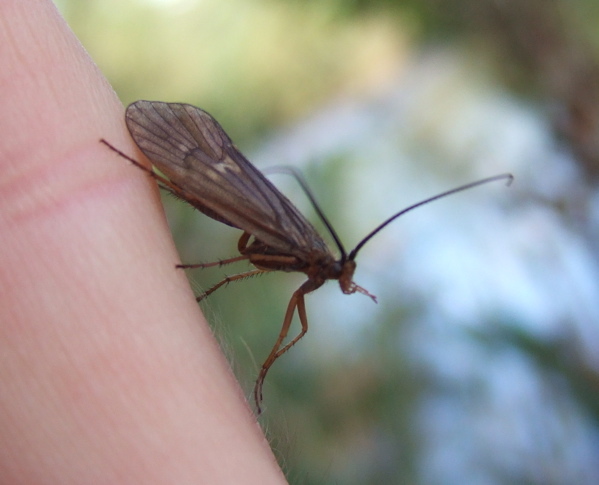 It is clearly very healthy in terms of insect life, at least under the surface. Turning a few stones over I was pleased to see huge cased sedge larva, upwing nymphs and even freshwater shrimp which I hadn’t seen here before. 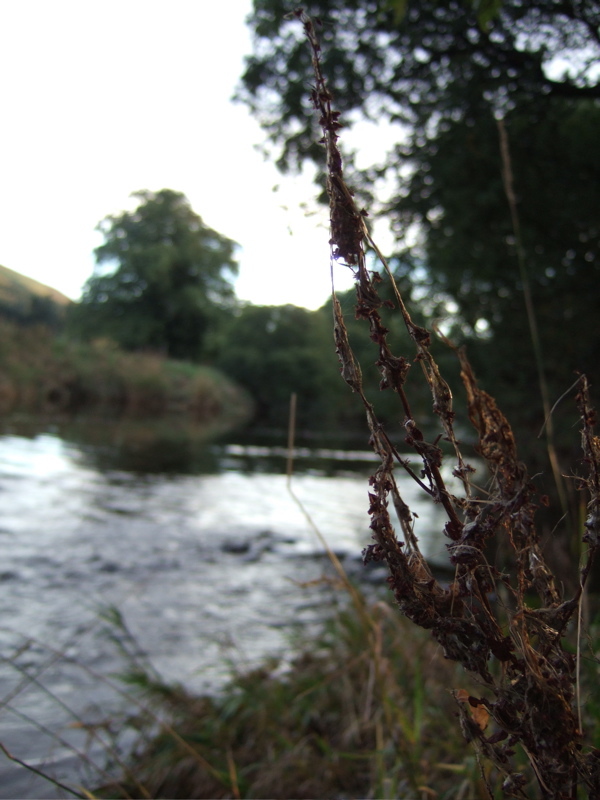 But despite this the river just doesn’t seem to hold the population of ‘average’ catchable fish you’d expect. In a way you can think about it like some of the New Zealand rivers, where there are small numbers of lunkers separated by not much. And there’s an example of one of the best of the ‘not much’ I caught all day. I fished hard all morning, then into mid afternoon before I found any fish rising. And then it was just these wee chaps who were possibly taking terrestrials falling off the trees. Using the smallest fly I could find it wasn’t very difficult to get takes from them. I gave up and moved on after a while because I don’t think it’s healthy for me or the river to hook parr like that. So after having fished everything from tiny sedges to massive tunsten nymphs I started heading upriver towards the car. I decided to stop for a wee while at a known pool. The pool you might say. It’s the kind of place that just has to hold one or two biggies. Not that I’ve ever seen a fart’s chance in the Arctic’s sign of any. Except today. Today I saw some fish. I saw two, maybe three nice fish. One of which was friggin big. Like the length of my arm. But I didn’t catch him because he only rose once, shortly after which he spooked the hell out of there. 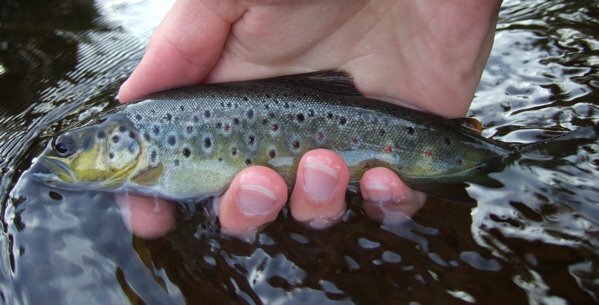 But I did manage to land a beautiful trout of around 11oz after casting to one of the smallest rises I’d seen all day. To describe a fish like this as gold dust up there is maybe wrong. No, it’s definitely wrong. More like huge hand sized chunks of gold studded with diamonds and sitting on a big chocolate gateau. When I hooked him I was convinved it was a 1.5lber. Had to be, there was a bend in the rod after all. And he jumped about like a maniac. And he was longer than my eh, finger. All said, I was really thrilled to catch him. One of my hardest worked for fish of the season. Sod that, by far my hardest worked for fish as I’ve had about 5 trips down to the river and he’s about as big as all the other fish put together. Crazing game, fishing. Nice write up, Mik. 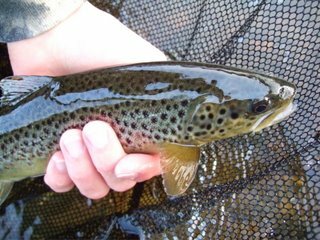 And a beautiful fish to finish the year…. Thanks very much mr windknotter 🙂 Cheers for dropping by.